00:20:00 Makes 4 servings, 1/4 recipe (346 g) each. Makes 4 servings, 1/4 recipe (346 g) each. The perfect Italian dish is made with just four ingredients: chicken, frozen mixed vegetables, pasta sauce and KRAFT Shredded Mozzarella Cheese. Cook chicken in large nonstick skillet on medium-high heat 2 min. on each side. Add vegetables; cover. Cook 5 min. Stir in pasta sauce. Simmer 5 min. on medium heat or until chicken is cooked through (170ºF). 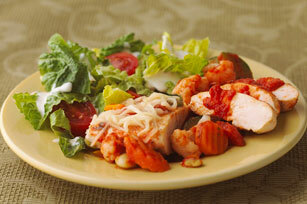 Serve with a salad tossed with your favourite Kraft Calorie-Wise Dressing. For perfect pasta that's cooked just right, test it often near the end of the cooking time suggested on the package. The perfect pasta is done when it's tender, but still slightly firm as you bite into it. To keep the pasta from cooking any further, immediately drain it in a colander. To quickly thaw frozen vegetables, place vegetables in colander and run under hot tap water for a few minutes. Drain well. This tasty chicken cacciatore is sure to please. As a bonus, the vegetables provide an excellent source of vitamin A. Serving Size Makes 4 servings, 1/4 recipe (346 g) each.